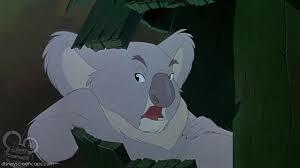 I animated many incidental mice and animated Krebbs, the koala, all myself in “The Rescuers Down Under“. I did tests of Krebbs and asked the directors to let me do the character until they finally gave it to me. This was my first opportunity to have my own character and I loved doing the research, learning the animal, and bringing him to life. 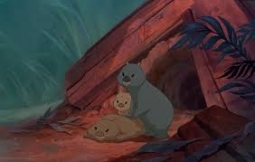 I did an enormous amount of research for this film on koalas, wombats, and white mice. I learned so much about their anatomy and how they move. My understanding of specific aspects of how certain animals move was increasing. I was learning what to look for in my research. How long does each foot stay on the ground in a particular gait? How far does the shoulder blade squash up? Which joints squash when they take weight, and how much do they squash? The more I learned about animals, the more they fascinated me. Animated animal characters eventually lead to my exclusive use of animals as subjects in my stone sculpture. “At Home with the Water Shrew” and “Alpine Harvest” are two of my favorite furry little animal sculptures.